Technology developments in the fields of electronic sensing, signal amplification, communications, and autonomous navigation have led to the design, manufacture and deployment of autonomous environmental sensors in distributed networks allowing monitoring of a number of environmental variables in near real time at multiple locations. Autonomous instrument-laden platforms plumb the ocean depths at unprecedented data rates, and active and passive electromagnetic sensing instruments aboard satellites in terrestrial orbit provide wide ranging synoptic views of ocean surface and subsurface features. 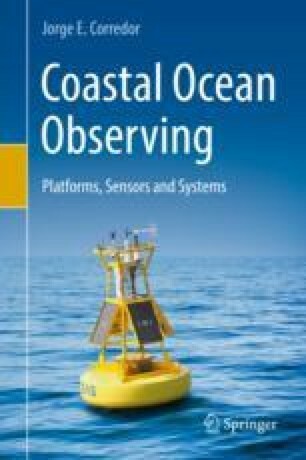 Advances in autonomous remote sensing are contrasted to the historical practice of ocean observing aboard manned vessels. The nature and priorities of operational coastal observing systems are set forth emphasizing the timely release of data and data products tailored to provide societally relevant oceanographic information. One major development of the past decade was the advancement of operational oceanography and, specifically, the implementation of ocean observing systems that encompass observations, models, and analysis to yield societally relevant oceanographic information in near real time.